This resume goes straight to the point. CV template to download "Assiduous"
The Assiduous Resume is one student resume template that is sure to get you hired! 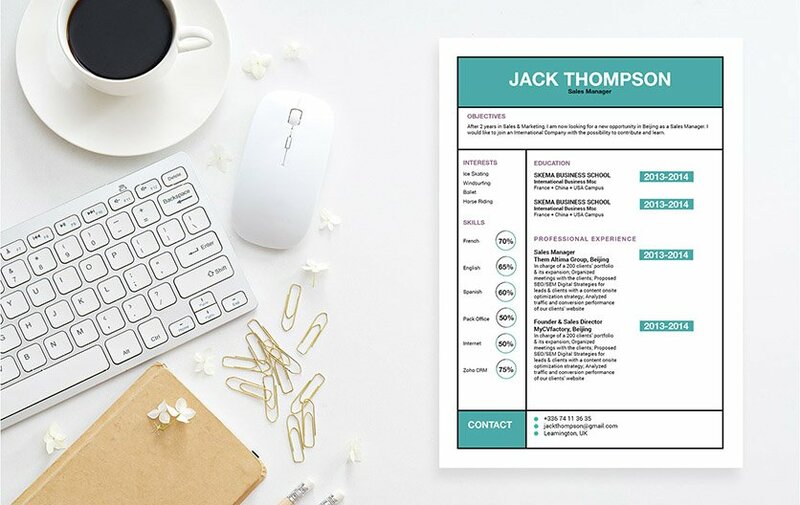 The effective use of colors, shapes, and texts make an attractive resume design that you can use to apply for any type of job. This is especially ideal for students who are seeking to build a good work background as this resume's well-structured design presents all the relevant content to your employer in good detail, which is sure to increase your chances of landing a job! Give your resume a clear and comprehensive lay out, this allows it to get the attention of more recruiters, and of course increase the chances of land your dream job! A new resume is typically looked over for about 10-30 seconds—it doesn't get fully read the first time around! Therefore, all your content must be written in a clear and concise lay out. To achieve this, select a simple yet professional looking font such as Helvetica or Sans Seriff. Font size should only be between 11 and 12, and selectively use italic/bold font styles to guide the eyes of your reader with ease along your resume. The use of symbols and graphics gives emphasis on the key phrases of your CV. Finally, give your resume a logical format by using headings and subheadings.